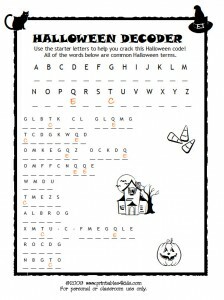 Our Halloween Code Breaker (or Crypto-Quiz) activity is the perfect activity for a Halloween party game, a classroom activity or a challenger for the big kids. I would recommend this type of activity for kids 8 & up – and grown-ups, too. Use the starter letters to help you figure out which letters are which and decode 10 very common Halloween words. Stuck? Look in the comments below for the list of answers. Click on the image below to view and print full size. Don’t forget to check out all of our free printable Halloween coloring pages, pencil games and more! Or try some of these Personalized Printable Halloween Games.